Hola Amigas!! Feliz Cinco de Mayo!! Okay, I have exhausted my knowledge of Spanish, lol! Actually I think a lot of you might think I am Hawaiian, but in reality I am Mexican. Si, both of my parents families are from Mexico. My mother's family has ancestry back to the Aztecs and my father's family goes back to Spain. He had to quit school at 12 and work in the streets for money. At 18 he left Mexico and moved to Colorado to live with an Uncle. He taught himself English and got a job sweeping floors at restaurant at the Denver Airport. From there he worked his way up and eventually ended up working for Delta Airlines for 30 years!! Needless to say he pushed all of his kids to do well in school No Matter What!! Back in the 70's though he didn't want us to be different, so he and my mother never spoke to us in Spanish. He wanted us to be American. So I am a Mexican/American who resides in Hawaii, that does not speak Spanish!! I can actually cook a few Mexican dishes .... my enchiladas are delectable and my salsa is excelente!! This is a quick no frills salsa recipe that I always make. I usually have all the ingredients in my pantry and I have cilantro growing in my backyard. I throw it all in the blender, chop for a few seconds...done. Add chips and you are good to go!! Alright if this hasn't made you too hungry stick with me because I have a freebie for you. I created this little game to help my students practice their addition facts up to 20. Our district has mandated that all students in second grade be able to complete 50 additon facts up to 20 in 2 1/2 minutes!! My kids do great with single digits, but this test includes problems all the way up to 20 + 0. 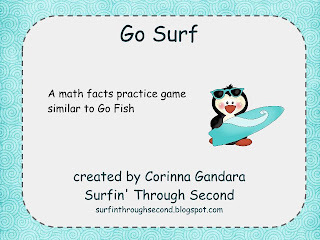 So I made up a fun game called Go Surf....wherever did I get that name??? You can pick it up in my TpT store. Anyone have a similar math facts assessment that their kiddos have to pass?? I'd love to hear about it. Thank you so much for the cute game! My class is going to have fun playing this next week! Mmmm salsa! The school I've been subbing for the last few days and on Monday, are having a salsa contest. I'd love to be the taste tester lol. I just found your blog. It looks so cute! Thanks for following Sara, glad to have you!! You're right! I just assumed you were Hawaiian living in Hawaii and all (which, by the way, I am deeply envious of :))) I went to Hawaii 18 years ago and loved it! I also loved reading about your family history. Those kinds of stories are very heart-warming! Thanks for the yummy recipe and the math freebie!! Yummy! Thanks for sharing! I am so glad you stopped by our blog so we could find you! can I tell you??? I instantly had to go buy the clip art! haha!! WOW, 50 in 2.5 minutes! That seems really hard.....but maybe it's because I don't teach gen ed kids to see what most kids can do. Thanks for the game! It's cute! !